You can reuse a budget for recurring projects by saving it as a template instead of creating a new one every time. 2. Mark the budget you would like to save as a template. If you do not want to save all budget items, then only mark the ones in the budget items list which you want to include in the template. To choose multiple items, hold the CTRL button and left-click on all relevant items. 3. Click on Save Template in the ribbon. Name: Assign the template a clear name so you can easily find and easily match it later. Type: The template will be assigned the same budget type as the original by default. 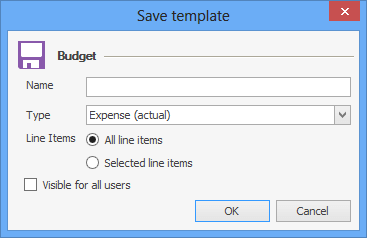 Line Items: You can either save the whole budget including All line items, or only the Selected items you have marked in step two. Budget templates are not automatically visible to all users. If you would like to make it Visible for all users mark the box accordingly. 3. A dialogue window will open where you can choose a template from a dropdown menu. You can also get a preview of the budget items saved in the template. 4. Confirm your selection with OK.
Save and load budget templates - InLoox • Copyright 1999-2019 © InLoox, Inc. All rights reserved.